The Mong Ton dam will provide 90% of its hydroelectricity to China and Thailand, leaving ethnic minority communities in Myanmar’s Shan state to bear the costs. Tens of thousands of people will be displaced when dam’s 640-square kilometer reservoir fills, and habitat will be lost for endangered species like the clouded leopard and Sunda pangolin. Even before the dam is complete, its construction has accelerated deforestation and resource extraction in the area. The riverscape of Kunhing township, whose name means “thousand islands” in the Shan language. Photo courtesy of Action for Shan State Rivers. Before reaching the Keng Kham valley, the bright green Pang river, the Salween’s major tributary running south through central Shan state, splits into three parallel rivers that form myriad channels creating islands and islets, blurring the line between forests and water in a pristine and biodiverse riverscape. Rarely seen by outsiders, these are the famed “thousand islands,” forming a stunning inland delta that gives the “Kunhing” township its name. To the south, the Pang meets the Salween in a cascade of waterfalls. Seen from the air, white water tumbles down through verdant forested islands on an escarpment hundreds of meters long. The thousand islands’ labyrinthine landscape and its surrounding forests bloom with tremendous ecological and ethnic diversity. If plans for the Mong Ton dam go ahead, they will all be lost under the giant reservoir. Early stages of construction have already started on Mong Ton, the biggest hydropower project planned for the Salween. Logging in the future flood zone and gold mining along the river bed is already stripping the land upstream of the project of its natural resources before they sink underneath the Salween’s murky waters. The dam site is located in a heavily militarized area in southern Shan state between territories controlled by Shan and Wa forces, and its flood zone is projected to be roughly the size of Singapore at 640 square kilometers. In addition to the huge environmental and social costs of building the Mong Ton dam, observers are also concerned that the dam lies near an earthquake fault line, in the “most earthquake prone region in Myanmar”, Hla Hla Aung, a senior researcher at the Myanmar Earthquake Committee told The Third Pole earlier this year. Kunhing township in Myanmar’s Shan State. Maps courtesy of Google Earth and Google Maps. This is the third article in a five-part series exploring Myanmar’s Salween landscape amid galvanizing plans to develop hydropower projects along its course. Part I outlines plans being made by businesses and governments in China, Thailand and Myanmar to harness the Salween’s vast hydroelectric potential. Part II looks at Salween dams’ already bloody legacy and the projects’ direct or indirect relationship with perpetuating instability and conflict in Myanmar’s Shan and Karen states. Part IV meets actors involved in creating the “Salween Peace Park,” combining wildlife conservation and peace-building in Karen state, where the world’s longest running civil war has raged since 1949. Part V focuses on downstream Salween communities’ livelihoods and ongoing changes facing the broader Salween landscape due to Myanmar’s rapid economic development. Cascades of ecotourism potential - the Pang river forges its way through some of Shan state’s remaining globally significant forest tracts. Image courtesy of Action for Shan State Rivers. Shan state is Myanmar’s largest and most ethnically diverse state, populated by dozens of ethnic minority groups, including the Shan, Palaung, Pa-O, Wa, Lahu, Padaung, Akha and Lisu, all with divergent dialects or languages, customs, traditional dress and beliefs. In Kunhing township, and throughout the Pang and Salween watersheds, rural populations depend on the river and the forest to survive. They grow rice and vegetables in the lands surrounding the river, their lowland farming tracts dependent on river water for irrigation. The river is harvested for fish, crab, prawns, snails and oysters. The surrounding forests provide vegetables and mushrooms, traditional medicines and firewood. 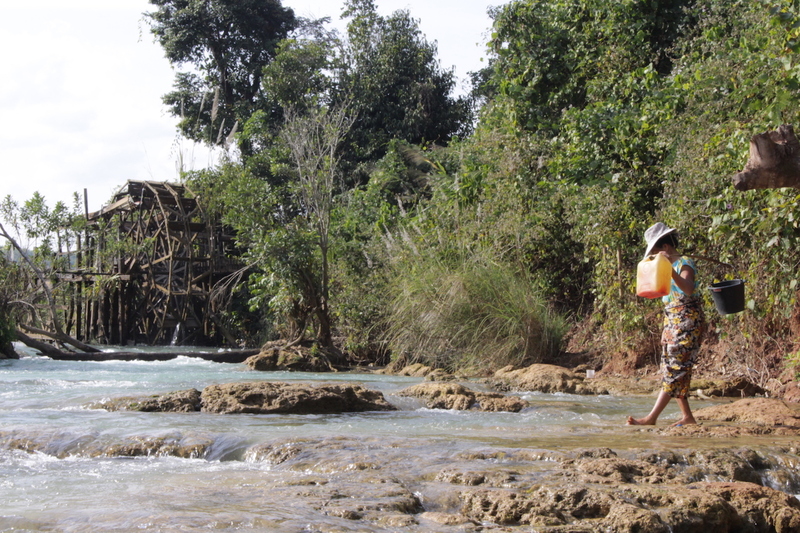 For the moment, some communities here get their electricity from mini-hydropower on the Salween’s tributaries. Kunhing township is dotted with historical sites of deep significance to Shan people, including ancient pagodas, traditional Shan chiefs’ houses and sacred cave temples, Nang War Nu, Director of the Kun Heing Foundation and ex-member of parliament for the Shan Nationalities Democratic Party told Mongabay. The Keng Kham temple is immensely significant to local Shan people and an important part of their cultural heritage. According to local villagers it was built before World War II, when individual Shan states were were ruled by “sawbwas.” Image courtesy of Action for Shan State Rivers. The significance of the land to its residents is profound. Forests, fisheries and waters are assigned not just economic, environmental and political value, but also deep cultural, social and spiritual meaning. “My spirit is there; I am connected to this land. If I die, my spirit will be there.” a Paw Tao Ma Ha, a villager from the Keng Kham valley living in exile in Thailand, told the Shan Sapawa Environmental Organization in 2009. In the succeeding century, hunting and deforestation took a heavy toll on the region’s biodiversity, but even today the unique ecosystems of the Salween watershed support globally endangered species. In pockets of remote mountainous forest habitats, the Indochinese tiger, (Panthera tigris corbetti), clouded leopard (Neofelis nebulosa), Sunda pangolin (Manis javanica), a type of wild cow called banteng (Bos javanicus), can still be found, among hundreds of other globally important species. But decades of conflict and the remoteness of the Salween mountains and valleys have left the river and its ecosystems woefully understudied, meaning current information on the ecological health of the watershed is extremely scarce. As well as unleashing a myriad other environmental and social consequences on the biodiversity and local people, the Mong Ton project’s vast reservoir would inundate unexplored areas of global ecological importance. Par Zoi lived in a village in the Keng Kham valley until she was 18, when she was forced to relocate to Nar Sae village. Before the forced relocation due to the Myanmar Army’s offensives began in 1996, the Shan Sapawa Environmental Organization estimated the total population of the Keng Kham community to be 14,800 - in 2009 they reported the population had dwindled to about 3000 people. Photo courtesy of Mong Pan Youth Association. A $10 billion hydropower project backed by Thai and Chinese developers, the Mong Ton dam will export 90 percent of its energy to China and Thailand. Critics of plans to develop the Salween’s hydropower potential lament that China and Thailand will purchase most of the energy produced by the dams, leaving some of the poorest people in Myanmar — and indeed the world — to deal with the consequences. The project threatens to evict tens of thousands of people, including approximately 50,000 from Kunhing township, many of whom have already suffered from decades of conflict and displacement. For ethnic minorities that face flooding, their way of life will be over. “The forest and the river are so important not just for me, but for everyone living along the river basin. All of our livelihoods rely on the water and the forest,” 61-year-old Par Zoi from Nar Sae village in Kunhing township told a researcher working for Mongabay. These riverine communities, who are almost wholly dependent on agriculture, are already increasingly vulnerable to the effects of climate change. In recent years, they have noticed increased sediment in the river, changes in its depth, or unusual floods. “Even before they are building the dam, we are already experiencing strange changes in the weather,” Kham Mai, campaign coordinator at the Shan Sapawa Environmental Organization, told Mongabay. “How will they cope when the dam is built? Because some of the villagers live on the islands, small islands in the river, so they are so worried about that.” she said. The livelihoods of the people living along the Salween and its tributaries depend on the river. Photo courtesy of Mong Pan Youth Association. The tropical mixed evergreen and deciduous forests in Shan state are some of Southeast Asia’s last remaining “globally significant” tracts. Thanks to projected forest loss due to illegal logging, agribusiness expansion and unregulated infrastructure development, the WWF has identified the region as one of ten global “deforestation fronts.” The high rates of deforestation prior to the construction of dams, and the loss of forests once reservoirs are filled, will contribute to climate change and incur huge biodiversity loss, further impacting the ability of local subsistence farmers to support their livelihoods. Hydropower development projects are one of the primary causes of deforestation worldwide, and the Mong Ton dam illustrates how this happens. Preemptive logging is taking place along access roads, as is clearing of forested areas that will be flooded by the dam’s reservoir. “Sometimes I go to the forest to hunt for small animals, vegetables, bamboo, mushrooms and seasonal crops. The forest is very important for people, especially local indigenous people like us,” Sai Lu, also from Nar Sae village in Kunhing township told a researcher working for Mongabay. “We have many kinds of wild animals here. I can’t say if they are less or more now, but what I can say is I think because of the logging we don’t see them near the village anymore.” In a study done earlier this year, researchers working with think-tank CGIAR found that 75 percent of the people they interviewed in a village near the dam site reported a negative change in forest and river ecosystem services, which they attributed to the logging around the dam. 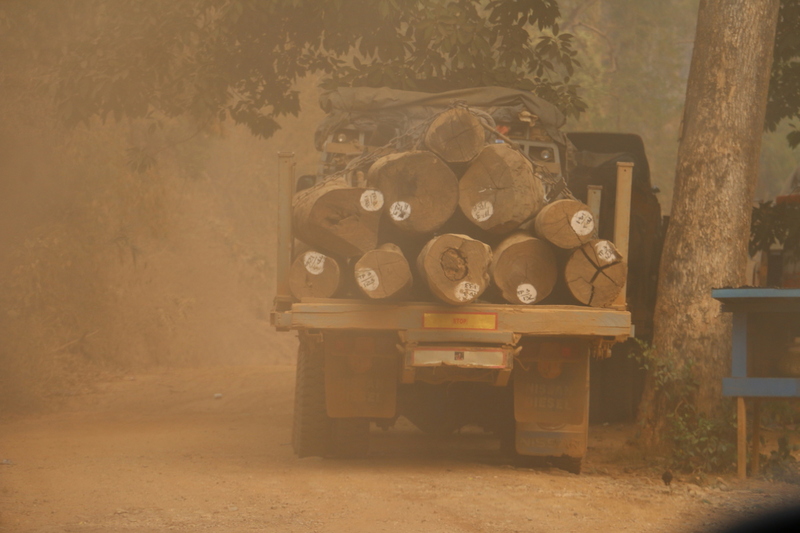 Logging trucks pictured at the Mong Ton dam site in March 2016 by the Karen Environmental Social Action Network. Photo courtesy of KESAN. An environmental impact assessment (EIA) and social impact assessment (SIA) conducted for the Mong Ton dam was conducted by an Australian company, the Snowy Mountain Engineering Corporation (SMEC) in 2015, but has been lambasted by critics of the dam. The company’s consultations were branded a “rubberstamp” by ethnic communities from the area, who were enraged that SMEC appeared to be downplaying the negative effects of the dam. SMEC were unable to complete their survey work in all of the projected dam-affected areas due to some villagers vehemently opposed to the project refusing to take part in surveys, or blocking SMEC from entering villages altogether. They were also blocked from entering the affected area in the Wa region by the United Wa State Army (UWSA) in July 2015. Clashes had broken out between the UWSA and the Tatmadaw in June just north of the dam site. Attempts to contact SMEC by Mongabay were unsuccessful, but in a statement sent to the Irrawaddy magazine last year the company warned that disruption to the EIA/SIA process and their data gathering could lead to “suboptimal outcomes for the affected communities”. The river and its banks are sites of both daily life and religious observance. Photo courtesy of Mong Pan Youth Association. Furious with SMEC’s handling of its Mong Ton work, campaign group Action for Shan State Rivers said in a statement released in August 2015, “SMEC had angered locals by blatantly promoting the dam in public meetings, downplaying negative impacts, and promising them electricity, even though the dam’s main purpose is to export power to China and Thailand.” The group also delivered a petition with 23,717 signatures opposing the dam’s construction to SMEC’s Yangon office. “The government should recognize the voice of the people and they should cancel all of the Salween dams because there are no benefits for Myanmar at all, mostly the benefits will go to neighboring countries,” Sai Khur Hseng, a representative of the Shan Sapawa Environmental Organization, and a vocal critic of the dam projects, told Mongabay. The Myanmar government’s estimated completion date for the Mong Ton dam is 2030-2031. President Htin Kyaw announced a new commission on Aug. 12 this year to evaluate all the planned hydropower projects on the Irrawaddy River, but the Salween has been afforded no such providence. The launching of a Strategic Environmental Assessment (SEA) across Myanmar’s hydropower sector in September this year by the World Bank Group’s International Finance Corporation (IFC), and Myanmar’s MOEP and MOECAF, has been given a cautious welcome by some observers, who hope it could encourage the government and dam developers to adhere to international standards of practice. Others are deeply skeptical of the process and worry that the SEA assumes large hydropower development in Myanmar is a foregone conclusion. The World Bank Group and the Asian Development Bank have advocated for and provided loans to construct large dams across Southeast Asia, leaving many to question the objectivity of an assessment guided by IFC. “The SEA starts from the assumption that large-scale hydropower is a given, rather than enabling consideration of alternatives that could inform open discussion on the best means of meeting Myanmar’s energy demands and priorities,” Pai Deetes, Thailand campaign coordinator for International Rivers told Mongabay. The cumulative effects of the Salween dams will also have transboundary impacts in China and Thailand, but these appear to fall outside of the scope of Myanmar’s SEA, which will only involve assessments and consultations within Myanmar, said Deetes. Clouded leopard, one of the endangered species whose habitat is threatened by the Mong Ton dam. Photo by Rhett A. Butler. Activists, environmentalists and renewable energy experts in Myanmar are urging the government to call a moratorium on the Salween dams. They advocate for greener energy alternatives in place of mega-dams, such as mini-hydro, solar and wind power, which they say can be deployed more quickly to feed Myanmar’s growing need for electricity. “Because 70 percent of Myanmar’s population live in off-grid rural regions, prioritizing small-scale and decentralized energy sources over mega-dams is a better way to meet the immediate needs of local people,” said Deetes (more in Part 5). Continue reading Part IV of this series, which introduces efforts to build peace and conserve wildlife in Karen State. 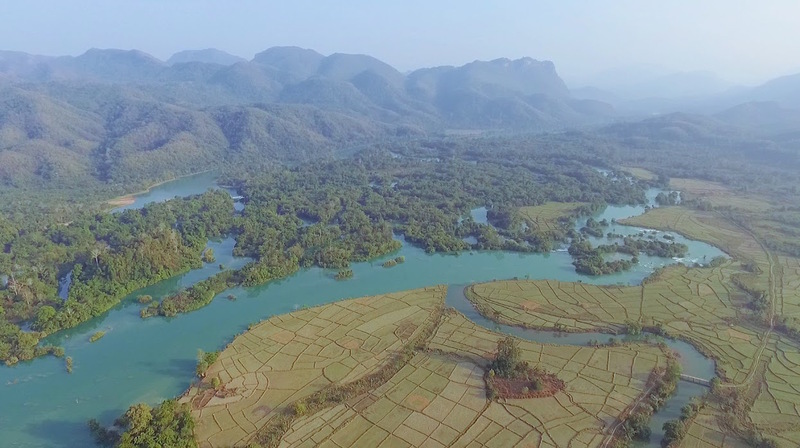 Banner image: Aerial view of cascades on the Pang River, courtesy of Action for Shan State Rivers.